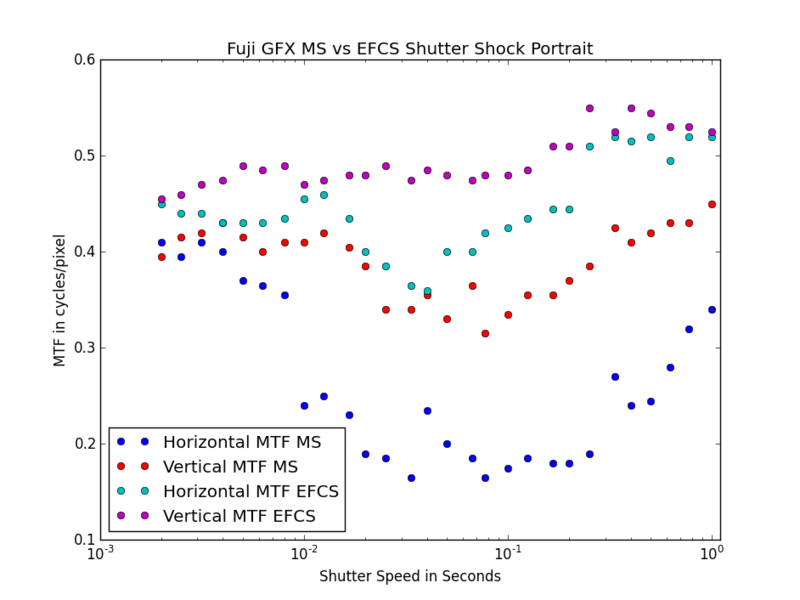 Previously, I described testing the shutter shock of a camera using an MTF chart. In that test, the Fuji X-T2 didn’t show a lot of shutter shock. Here, I am hoping that the larger shutter of the Fuji GFX 50s will make the effect more obvious. I am using the Fuji 110mm F/2. As can be seen from the MTF50 measurements below, this is a really good lens. The tripod in this case is the RRS TVC-24 with the BH-40 w/ lever clamp. Procedure is as follows. Focus the lens to the target wide open, then stop down to f/4. Maximum light on the target. ISO 400, Raw. Set the desired shutter speed on the camera. Adjust the variable ND filter to the point that correct exposure is achieved. I started at 1/500s and worked down to 1s in 1/3 stop increments. No refocusing between images or between MS and EFCS. Import images to Lightroom and export to tiff with default settings. Open images in MTFmapper to analyze edge acuity. There is clearly a small dip right around 1/60s shutter speed in both the horizontal and vertical MTF. We expect the vertical MTF to be a bit worse, since that is the direction that the shutter moves. 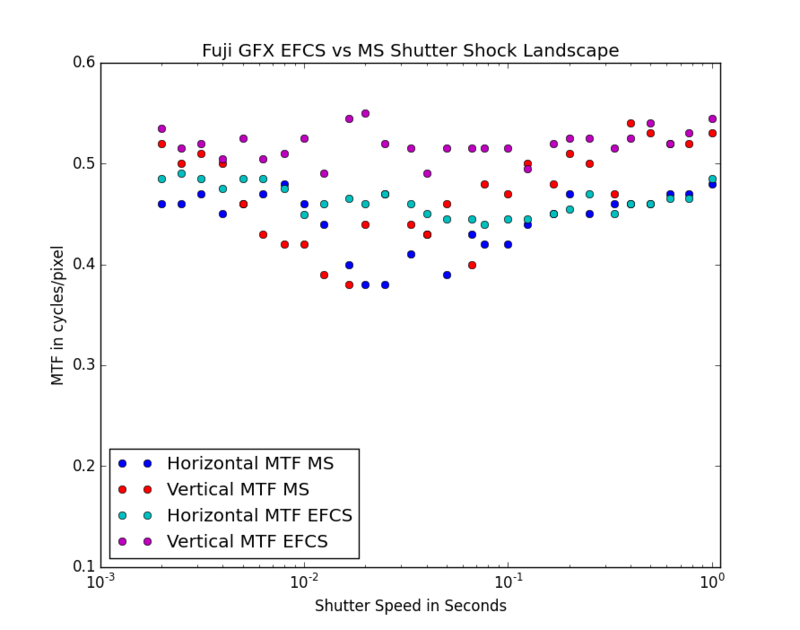 Indeed it declines slightly before the horizontal MTF, but actually recovers faster as the shutter speed drops. The EFCS is consistently good. The sharpness of every one of these images is very good. The slight dip measured here would not be noticeable in real world images. Here is the same plot but for the camera oriented in portrait mode. I am using a RRS L bracket to mount the camera in portrait mode. The difference between the MS and EFCS is much larger here. We expect portrait mode to be worse as the shutter motion is no longer straight up and down over the center of the tripod. It exhibits a torque about the tripod’s apex, causing the camera to move side to side. This is clearly shown in the loss of sharpness in the horizontal MTF for the MS between 1/100s and 1/4s. This would be noticeable under careful inspection on real world images. Clearly it is better to use the EFCS in this case. 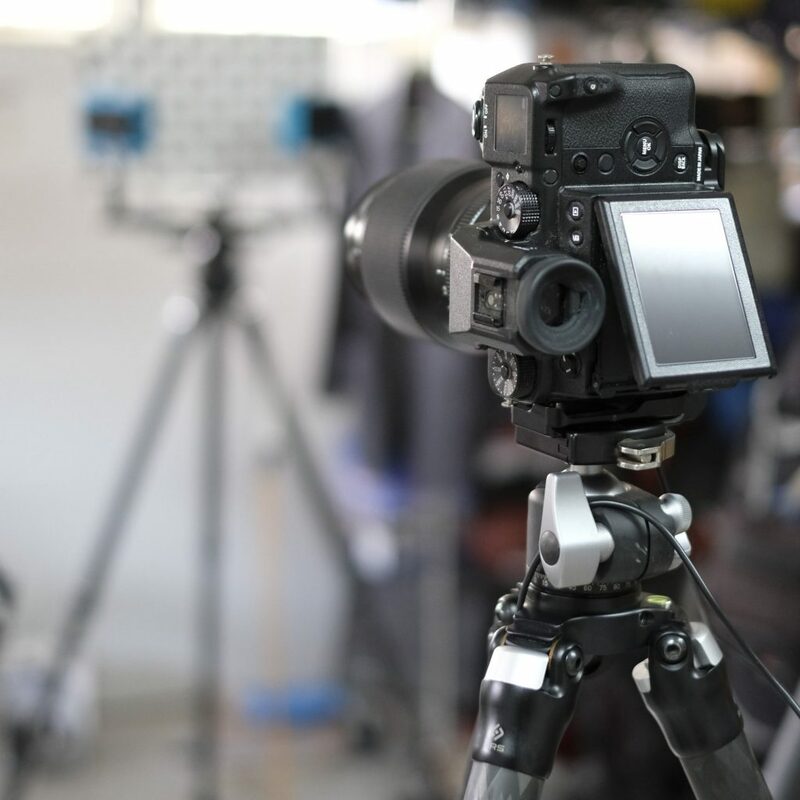 Can the mechanical shutter shock be mitigated with a stiffer tripod? How does the focal length of the lens change things? How does using a lens with a foot, moving the camera away from the center of the tripod change things? For any kind of photography done off of a tripod, why not just set the camera to EFCS and move on with life?